In 1985 Mike Burn joined the underground-formation 'Secret Society', in which incidentally Sebastian Teufel played the drums (nowadays drummer of the Indie-Band 'Yellow Jumps Twice'). Already at this time Mike's guitar playing was deemed exceptional. Before that, in his early youth, he laid down together with drummer Jaro Forejt the basic foundation for what became known as the 'Eschborner Kellerconnection', which was supported by bass player Mike Debus and keyboarder Willi Bopp (all native from the tiny town of Eschborn). Not only in Germany Mike Burn belongs to the pioneers of the independent MP3-movement, since already in 1996 together with the gifted 3D-designer Andreas Matzke he frickled on one of the very first Indie MP3-videos ever, which back then became a classic on MP3.com. In the following Mike participated in far more than 100 online-collaborations with musicians from all over the planet, among others with Lauren Gibbs, Priscilla Hernandez, Mark Hewer and Daniel Iorio. 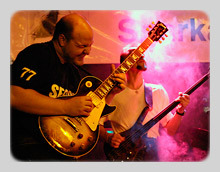 The instrumental "Sonosphere" combines a jazzy athmosphere with rock guitar bendings. Sono-Guide: Les Paul Standard through a 50W Peavey Classic.